Evelyn Talbot has achieved her goal of establishing Hanover House. a residence for some of the worse psychopaths in the world. Evelyn's goals in this was to analyse these vicious killers. Her primary reason was her own horrific experiences when she was kidnapped and tortured by her boyfriend while she was a teenager. As a leading psychiatrist, she certainly is successful, but is she safe? During her few years there in Alaska, there have been some brutal murders, and it is very likely that her previous boyfriend, who was never caught, is right there and she is in danger. Her current boyfriend, Alaska State Trooper Amarok, finds the eerie truth that the man, Jaspar Moore is there, but where. It is known that he has had reconstructive surgery, so he could be anyone. But there is no one new there. Who is responsible for the two latest brutal murders? 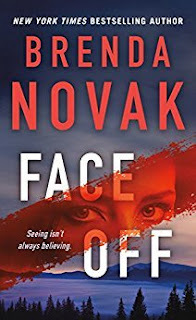 Before I begin writing my actual review, suffice it to say that Face Off is the third book in the Evelyn Talbot series. I do not think this book would do well as a standalone. The series begin with a novella, Hanover House, and was followed by two other novels, Her Darkest Nightmare and Hello Again. I felt it was necessary to mention all of these titles because they should be read in order. However, in the early chapters, readers are familiarized with Evelyn's past, Jasper's sadistic and murderous activity and Evelyn and Amarok's relationship. It has been a few years for Evelyn at Hanover House and things are changing. While Evelyn's relationship with Amarok is reaching new heights, the formerly quiet Alaskan town is again plagued with murder. Meanwhile, Evelyn finds that her family needs her and this may affect her plans in both a personal and professional level. As gruesome as the subject of serial killers is, this series is a definite hit and ranks as one of my favorites. One of the things I like most about it is that it is also a romantic suspense. As each story is developed, it was a delight to see the romance abound. For what Evelyn went through at the hands of Jasper, for her to have found such a solid love through Amarok is very rewarding. I loved the conclusion and was definitely kept on my toes during the twists and turns along the way. What made this story exceptionally chilling is the narrative in Jasper's voice. From the very first book in the series, readers know who Jasper is pretending to be and how he can be among Evelyn, Amarok and her staff. My only complaint is that there are too little books and too little time. If not, I would have devoured this series more quickly. I do hope there is more from Evelyn and Amarok in the future. Many thanks to St. Martin's and to NetGalley for this ARC to review in exchange for my honest opinion. Brenda and her husband, Ted, live in Sacramento and are the proud parents of five children—three girls and two boys. When she’s not spending time with her family or writing, Brenda is usually raising money for diabetes research. Her youngest son, Thad, has diabetes, and Brenda is determined to help him and others like him. She also enjoys traveling, watching sporting events and biking — she rides an amazing 20 miles every day! I haven't read a Brenda Novak book in ages.. It's now time to,I believe..Great review! I think I'll start with book one. I've never read a Brenda Novak book, but I keep. Seeing similar reviews to. Yours. I'm glad you enjoyed his one. wow, this book wounds great. Lovely review. Great review Robin, I am really glad you are fully enjoyed reading this book series so far in. Thank you so much for sharing your awesome post.